It was just another Saturday night at Community First Soo Pee Wee Arena. Then again, it is one of my favourite ways to spend a Saturday evening during hockey season in Sault Ste. Marie. Simply put, it is grassroots hockey that, without question, is for the love of the game by the kids who play it. 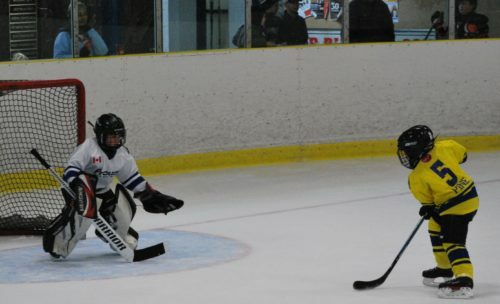 In this photo by freelance photographer Allana Plaunt, goalie Owen Whitehead of the Prouse Motors Panthers prepares to make a breakaway save off Dominic Pine of Rotary Club during Soo Pee Wee Hockey League, novice minor division action at the good, old Soo Pee Wee Arena. The novice level is for seven-year olds.